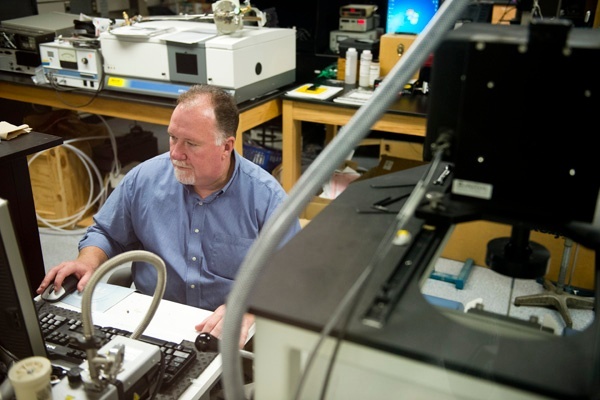 University Distinguished Professor Vincent Harris had been developing novel materials at the Naval Research Laboratory for almost 15 years when he founded Metamagnetics, a small business that develops radar and communication electronics for military applications. The team developed great technologies with the financial assistance of several National Science Foundation grants, Harris said, but often times those technologies would be left hanging on the vine went the grants expired. With Metamagnetics, which has netted a total of $6.5 million in federal funding, Harris took the basic research off the vine and out of the lab, translating it into something valuable for the nation and the economy. Metamagnetics and two other Northeastern spinoff companies—Novobiotic Pharmaceuticals and Akrivis Technologies—are highlighted in a new national report released Tuesday by The Science Coalition, a nonprofit, nonpartisan organization of more than 50 of the nation’s leading public and private research universities including Northeastern. “The report was developed during this challenging federal budget environment, to make the clear case for continued federal investment in basic research that results in tangible outcomes,” explained Tim Leshan, Northeastern’s vice president for government relations and the current president of the Science Coalition. Founded by biology professors Slava Epstein and Kim Lewis, Novobiotic Pharmaceuticals is seeking out new antibiotic compounds by developing technologies that cultivate microorganisms previously impossible to grow in the lab. Akrivis Technologies develops targeted delivery platforms that allow clinicians to both treat and diagnose cancer earlier than traditional methods. The company was founded on basic research from pharmaceutical sciences professor Ban An Khaw’s lab. Sparking Economic Growth 2.0: Companies Created from Federally Funded Research, Fueling American Innovation and Economic Growth identifies 100 companies that trace their roots to federally funded university research. These companies—while only a tiny fraction of the new companies formed each year—are contributing to the U.S. economy in a significant way by bringing innovations to the market and creating new employment opportunities. The report finds that in the current funding environment, small businesses—especially those spinning out of university-based research programs—are facing serious challenges. Federal funding for R&D has been on a downward trend for the past decade, with funding levels in 2013 at historic lows. Sequestration, which began in March 2013, is set to run through 2021 and will wring an additional $95 billion from federal research budgets over this period. This national disinvestment in science will have real consequences. As the companies highlighted in the economic growth report illustrate, research and the transformative discoveries that flow from it often require sustained funding over many years to yield results. Metamagnetics, Novobiotic, and Akrivis Technologies, are prime examples of this return on investment. Their work also aligns with Northeastern’s commitment to use-inspired research that solves global challenges in health, security, and sustainability. Northeastern’s Center for Research Innovation is working to help faculty members create value out of their basic research findings. CRI offers a portfolio of programs to streamline the process and connect passionate researchers with highly motivated entrepreneurs. For more information on the report’s findings, see this infographic produced by The Science Coalition.